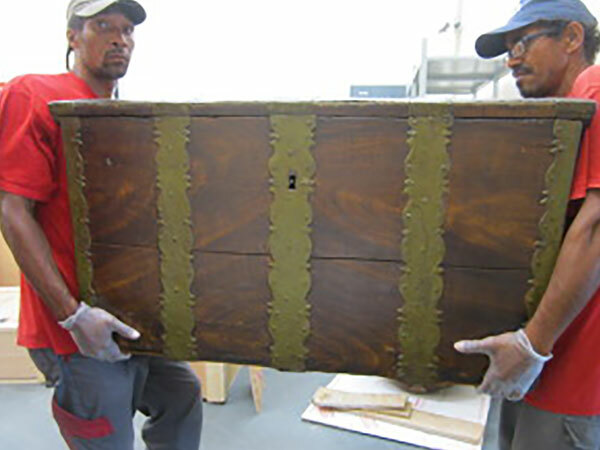 AGS is well-known for the high quality of our packaging and handling – of critical importance with art removals – and our branch in Guadeloupe recently demonstrated this during its work for the Memorial ACTe: a Caribbean centre for expression and memory of the slave trade, based in Pointe-à-Pitre. Having already proven their abilities through several art removal projects over the past 5 years, AGS’ team in Guadeloupe have become accustomed to this type of assignment. Conducted as part of the construction of the Memorial ACTe, the recent operation emphasized AGS’ commitment to the quality of the specialized packaging required for the transport of artwork. Particularly delicate in terms of handling and lasting for over 10 days, the project entailed 40 m3 of collectibles, sculptures, paintings, archaeological items, books, and other objects being carefully packed. These were then transferred from Guadeloupe’s regional headquarters to the Memorial ACTe, where they were unpacked and installed. “Works of art require specific attention – especially ceramics, earthenware and old manuscripts which have to be packed into protective crates,” explains François Chataigne, AGS Guadeloupe’s Branch Manager. To protect artworks during handling, specialised packaging is prepared. The construction of tailor-made protective crates and the use of polystyrene boards are keys phases for their packaging. The layout and loading of protective crates and boxes inside the truck are also major components of the preparation required for transfer. During this operation, three 40-foot containers – arriving from Paris and containing archived documents, icons and artworks – were received and unpacked on-site by AGS Guadeloupe’s team. This included two large-scale collection pieces that required particularly special care: The tree of oblivion from Pascale Marthine Tayou; and a marine anchor. While the anchor had to be carefully positioned near the Memorial ACTe’s entrance, the second installation was even more delicate. It required a 6m-long tree trunk being erected vertically within the museum’s scenic route, in a small 8m² room. Positioning the tree, weighing more than a ton, required all the ingenuity of AGS Guadeloupe’s team! He reveals that AGS Guadeloupe has already been contracted for another art moving operation in Guadeloupe for 2016. We wish AGS Guadeloupe every success, and are confident that they will once again demonstrate AGS’ commitment to quality packaging and handling. To request a free quote for your future art removal, follow this link.